Several authors characterized ground-water flow in the lower Potomac interval (Trapp and Meisler, 1992; Leahy and Martin, 1993; Trapp and Horn, 1997; Pope and Gordon, 1999). 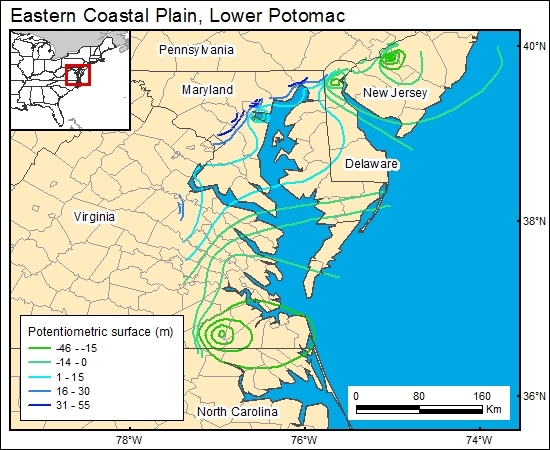 However, these studies focus on measuring and/or modeling hydraulic head in areas where the lower Potomac aquifer is shallow and contains fresh water, and their maps cover only areas that are inland (up dip) of the area of interest in this study. We used the combined information from Trapp and Meisler (1992), Leahy and Martin (1993), Trapp and Horn (1997), and Pope and Gordon (1999) to generate the hydraulic head/flow direction map presented in the GIS. Leahy, P. P., and Martin, Mary, 1993, Geohydrology and simulation of ground-water flow in the Northern Atlantic Coastal Plain aquifer system: U.S. Geological Survey Professional Paper 1404-K, 81 p.
Trapp, H., Jr., and Horn, M. A., 1997, Ground water atlas of the United States—segment 11, Delaware, Maryland, New Jersey, North Carolina, Pennsylvania, Virginia, West Virginia: U.S. Geological Survey Hydrologic Investigations, Atlas No. HA-730-L, 30 p.